A few weeks ago, we had some friends over for a lovely Shabbat (Jewish sabbath) dinner. Since I find myself in class for 8 hours straight on Fridays, instead of playing in the kitchen all day as I prefer to do before a dinner party, I went a bit Sandra Lee for this one. 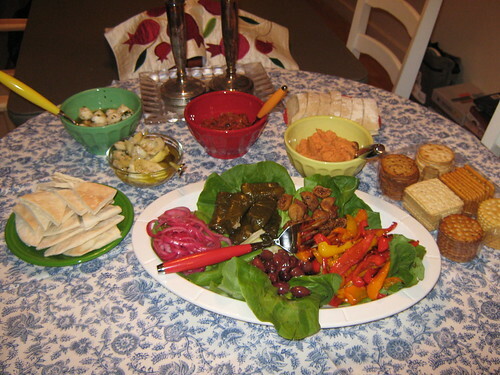 To start, I made a Mediterranean mezze spread. The table's only partially set in this picture, but you can get an idea. Clockwise, from left: pita, marinated mozzarella, marinated artichokes, sundried tomato bruschetta, sundried tomato hummus, crackers, and a platter with freshly roasted peppers, dried figs, stuffed grape leaves, pickled onions, and greek olives. There is also challah, ciabatta, and a veggie platter not pictured. This all looks pretty time-consuming, but was so quick. I made the hummus (recipe below) and pickled onions (same ones I made for Vday) ahead of time, quickly roasted the peppers before dinner, and the rest is from Trader Joe's. Delicious! 1. Bring a tea kettle of water to a boil over high heat. Place sundried tomatoes in a medium bowl; cover with boiling water to a depth of 1 inch. Set aside to soak for 10 minutes. 2. Drain tomatoes, reserving 3 tbsp. of the soaking liquid. 3. Place the soaked tomatoes, reserved liquid, chickpeas, lemon juice, tahini, garlic, onion powder, salt, and pepper in a large food processor fitted with the chopping blade. Process until smooth, scraping down the insides of the canister as necessary. That was just the beginning though! For the main course, I made Vegetarian Eggplant Stew from Almost Turkish Recipes via Food Blog Search, served over whole wheat couscous. Friends brought salad and dessert, and the meal was complete. The stew was seriously one of my favorite things I've ever cooked (don't I say that about everything? I heart hyperbole. ), and easy too. I was able to make it in the little time I had between class and company. It's also the kind of recipe that seems like it could be easily varied, depending on the veggies you have on hand. -Saute onions, garlic, and eggplant with olive oil on medium heat for 15 minutes. -Add tomato/pepper paste, stir for 1-2 minutes. -Add the rest of the ingredients except parsley. Cover and cook on low for 40-45 minutes. -Sprinkle parley on top a minute or two before you turn it off. Everything looks DELICIOUS!! Was your challah from Trader Joe's as well, or do you make your own? I am always on the look out for new (and potentially improved) challah recipes. @EthidiumBromide Thanks! I got it from a bakery in town that is the closest approximation to a Jewish bakery around here. I haven't dared to make my own yet, it's been on my to-do list for a long time. That all looks AMAZING!!! I love all the colors!